Furtherfield are taking the Shareable Readymades to London Art Fair this week, they’re for sale for Bitcoin and GBP. Who’d like a solid gold urinal? Antonio Roberts, Dead Copyright, 2015. Courtesy the artist. Prints of Urinal, Balloon Dog and Pipe are in the show. There’s also a new image in the catalogue that I created specially for it, I’ll talk more about that when it is released. The formerly transgressive gesture of the readymade and the assisted readymade – nominating or recreating a non-art object as art – has long since been recuperated by the artworld. The junkyard urinals and joke shop balloons of the early 20th Century have been replaced with expensive limited edition sculptures of them created by anonymous artisans, their status policed by lawyers and writers. The reputational dynamics of the artworld mean that non-art objects transformed into art objects by artists become part of their ouvre, or in contemporary art terms their brand. This represents a form of semantic enclosure, both of the potential of the object for alternative representations and of the artist’s particular take on the object. Academic reinforcement of this enclosure in terms of originality and reputation (through inclusion in positive or negative critical canons) causes a chilling effect on artistic potential. Legal enforcement of this enclosure becomes censorship. Art must be free to refer to and depict the world, including culture and including other art. This is a rare example of an artistic imperative being complementarily moral and aesthetic. Originality and the artist’s hand are valid subjects of critique within art – the fetish of the touch of the master as resource for and product of the art market and academia. But the returns on the reputational capital gained from being the creator of such a critique can exceed that of a previously historically conventional practice over time. And this critique of the artisanal production of art can also be an uncritical validation of managerialism. Both artisanal mastery and neoconceptual managerialism derive much of their increasing value over time from externalities. Artists do not (and should not) pay for audience, critical or market attention to their work that increases their reputational and economic value. But both artisanal studios and neoconceptual outsourcing rely on reputationally disenfranchised skilled labour to produce the art that accrues value in and to the artist’s name. The labour and reputational dynamics of the production of art are also valid subjects of critique within art, including that involved in the production art that critiques artistic originality. Is paying these workers enough, or should we hack the art historical firewall of the artists signature? Who are the artisans, studio assistants and engineers who instantiate contemporary art? What is the aesthetic and social impact of considering them? “Shareable Readymades” puts these critiques into tension with the hype and legal uncertainty around 3D printing. A decade ago I said “Now make art with it”. What’s emerged from making these particular objects is that they are a good resource for experiencing and thinking through the experience and implications of 3D printing if you’re familiar with art history. “You wouldn’t steal a car”, argue the old anti-copying warnings on DVDs that try and persuade you not to copy an infinitely copyable resource. Copyright on autographic artworks is a category error, on assisted readymades it is doubly so. But where it exists we can ironise it with Copyleft to ensure rather than frustrate people’s freedom to deal in common imagery and culture. This returns objects to the artistic commons in physically instantiable virtual form. Each Shareable Readymade was commissioned from a digital 3D modelling artist, who retains copyright on the results of their labour (Chris Webber for the Urinal and Pipe, Bassam Kurdali for the Ballon Dog, myself for #arthistory and the Soup Can). The objects are made available to the commisioning “artist” (Dr. Charlotte Frost for #arthistory, myself for the others) on the same terms they are made available to the public, the Creative Commons Attribution-Sharealike license. The “artist” is credited with commissioning the artwork using the Attribution part of the license. The rights-holding relations in the artwork are more just, the reputational ones are more open to question. As more people have incorporated the objects into their own art, fulfilling the ambition that they support the artistic commons, these questions have only grown. It is not clear how attribution for 3D printed works should function, should attribution conventions for art or for the license trump this? If so, which? The art historical, technical, and socioeconomic tensions that make up the Shareable Readymades are not intended to be simple or didactic. Each one has a different history and positioning in relationship to its referent. I hope that they are fun physically and conceptually and that they are useful objects for thought. Here’s Pipe in Furtherfield‘s show “The Human Face of Economics“, along with Urinal and Balloon Dog. You can buy one from them along with a certificate of inauthenticity. 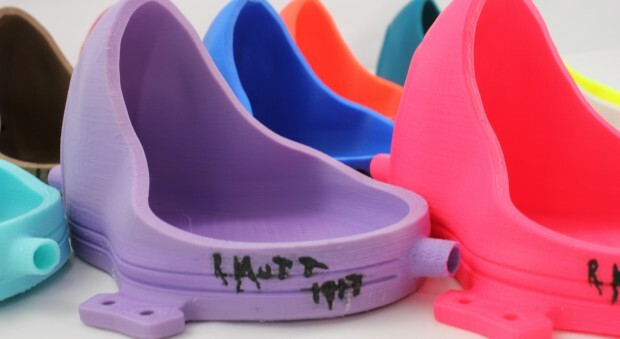 The 3D Additivist Manifesto video features the Urinal in its teaser image. Here’s an animated GIF by Alan Butler featuring a rare credited appearance of Balloon Dog. If you see any Shareable Readymades in the wild, let me know! Furtherfield present the Art Data Money special edition range of Shareable Readymades available to buy for Bitcoin or fiat currency (such as pounds sterling). Supplied with Certificate of Inauthenticity, signed by the artist (me). What is Art History Made of? I was very flattered to be asked by Dr. Charlotte Frost to become involved in the 3D printing side of her “Art History Hashtag” project. My “shareable readymades” project was in part a reaction to the treatment of artisans by post-conceptual artists such as Jeff Koons, so reversing the artist/artisan relationship from that project and becoming the person modelling the artwork appealed to me. Charlotte’s writing about the physicality of art history media touched on something I have thought since I was at art school. And I love typography and hashtags, with varying degrees of irony. Charlotte has now written about her inspiration for the project, providing a context not just for her immediate work but for any classical or digital humanities that wish to cross over with Maker Culture and/or to engage productively in a critique of the ways that their own medium specificity and physicality are implicated in their production. It’s an informative and valuable insight into the production of art and art history. I highly recommend it. This is exactly the kind of outcome of digital distribution that I was hoping for, and I love AFC, so I’m really happy to see these.